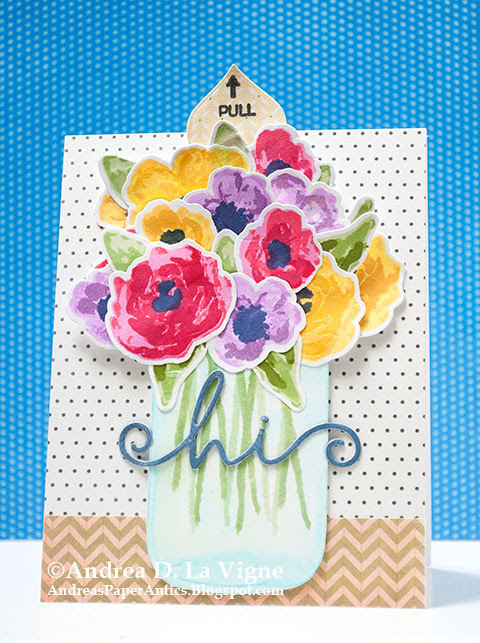 The craft for Day 4 of My Favorite Things' Camp Create is "Sensational Sliders." I must admit, I could count the number of slider cards I've ever made on one hand, probably with at least 1 or 2 fingers left over! But I decided to take the plunge and make a slider card. I decided to make my slider a floral arrangement. 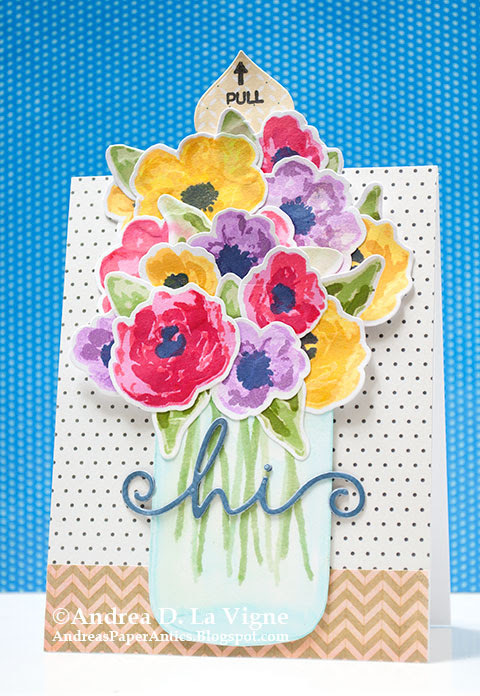 So I stamped all the images from MFT's "Watercolor Flowers" set multiple times. For the red flowers I used Hero Arts Bubble Gum, Memento Lady Bug, & Altenew Ruby Red inks. I stamped the purple flowers with Lawn Fawn Fresh Lavender, Hero Arts Orchid, & Memento Sweet Plum. I used Memento Dandelion & Cantaloupe with Simon Says Stamp Sunshine ink for the yellow flowers; and Altenew Frayed Leaf & Forest Glades and Hero Arts Forever Green for the leaves. I finished with Hero Arts Navy ink for the flower centers. After I had finished stamping all the flowers & leaves, I cut them out with the coordinating dies. I stamped Inkadinkado's "Mason Jar" on a scrap of Strathmore Smooth Bristol paper with Hero Arts Soft Pool ink. After I stamped the flower stems with Forest Glades & Frayed Leaf, I colored the water area with a light blue Tombow marker. I blended the color out with a water brush, & fussy cut the image. To create the flower arrangement, I took some of the flowers & leaves I'd stamped and die cut, and positioned them around the top of the jar. Once I had the arrangement like I wanted, I glued them to the jar & to each other, so they were all in one piece. I arranged the rest of my flowers & leaves in another cluster, and glued them to a scrap of white cardstock. Once the glue had dried, I cut that out with my scissors. For the slider, I created a channel on the back of the jar with 1/4" wide strips of bristol paper. I also cut a strip of bristol for the pull mechanism, and added a narrow strip to the bottom of it, to act as a stopper. I adhered my second flower cluster to the pull strip with Scor Tape, & determined where I wanted the slider to stop. I glued another strip of bristol across the back of my jar at that stop point, adding the glue only to the ends of the strip, so the pull strip would slide freely, and the stopper would catch on the cross strip. I die cut a heart with a Nellie's Choice "Straight Heart" die from a patterned paper scrap, and glued it upside-down on the top of my pull strip. I trimmed off the bristol that showed from behind the heart, and stamped the "pull" & an arrow from MFT's "Interactive Labels" set in Versafine Onyx Black ink. I cut a piece of black dot paper from Pebbles' "Garden Party" 6x6" pad and a strip of chevron paper from Basic Grey's "Fiction" 6x6" pad for my background. I adhered the chevron strip to the bottom of the dot paper, and adhered my focal image with Scor Tape. I ended up having to pull it apart, though, because the slider mechanism caught on the paper seam. So I added a piece of Scotch tape over the seam where the jar would cover it, and reattached my jar. That worked!